What is Move to iOS good at, where it fails, and whether can it be your choice to transfer from Android? This post will tell you every single detail. It enables you to move all important Android data, such as contacts, messages, photos, music, videos, calendar, app, etc. to your iPhone iPad easily and quickly. 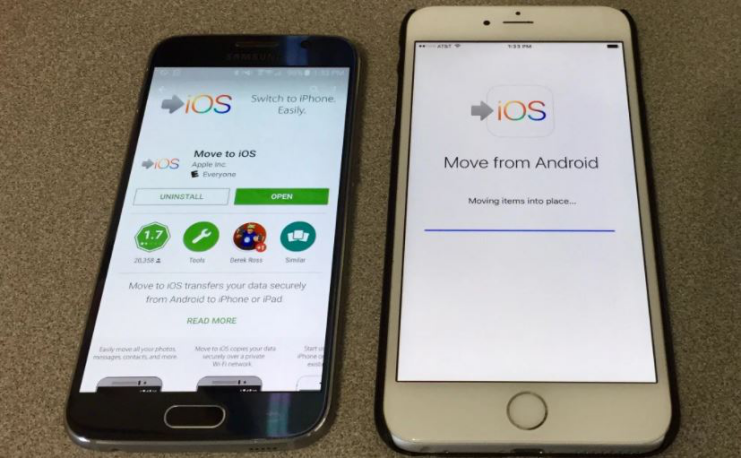 At WWDC 2015, Apple announced its first Android app coming - Move to iOS. Apple designed it mainly for helping people easily transfer Android data to iOS. However even though it was released in 2015, many users still know little about it. So we prepare for this Move to iOS reviews page to introduce you every side of it, good and bad, advantages and disadvantages, to help you decide whether choosing it to switch from Android to iOS or not. Move to iOS app can grab all your Android device information, and then plugs them in your new iPhone iPad over Wi-Fi. When you set up a new iPhone, select the option to import from Android, an authentication code will be generated, and then you enter that code and follow the prompts, after opening the Move to iOS app on your Android phone.The app will walk you through everything step-by-step. Your Contacts, Message history, Camera photos and videos, Web bookmarks, Mail accounts, Calendars are all ported over to iPhone iPad. So you can pick up everything on iOS, which you left off in Android. 1.Only a new iPhone, iPad, or iPod can be available to it. If your iOS device is already set up, you need to restore it to the factory settings firstly. 2.It can only work under Wi-Fi. Cellular data, or no network is unallowed. Besides both Android and iOS device have to be connected to the same Wi-Fi. 3.It won’t bring your apps over, of course, but it also doesn’t attempt to find the same app in the App Store. You’ll have to go fetch those manually, which may get tedious. 4.Most time, transferring process cannot start, or be stuck there forever. Mainly they are related to Wi-Fi disconnection, so you need to turn your Android to Airplane Mode. Besides, there are many other Move to iOS not working problems, according to thousands of user’s feedback. 5.There are no words to notice users how many items are already transferred, and many items are left behind without notification. Moving from Android to iPhone iPad is always a tough task, especially for new iOS users. Move to iOS app can be one of your great helpers to move from Android. However, it is definitely not the only one and the best one. It is not only because of its imperfect functions, which is unable to transfer apps, music, ringtone, bookmarks, etc., but also because of its frequently-happening unpleasant experience, such as Move to iOS unable to migrate, Move to iOS could not communicate with device, Move to iOS no code, Move to iOS Stuck on transferring/preparing, Move to iOS slow/takes forever, Move to iOS Wi-Fi disconnect/ drops, Move to iOS not connecting to device, Move to iOS interrupted, and so on. So, we sincerely recommend another better Android transfer to help you with switching from Android to iOS, and it is AnyTrans, designed by iMobie Inc. Why and how is it better? You must wonder this. Don’t worry. We will compare AnyTrans and Move to iOS app with a table in the following. Wi-Fi Yes No, USB cable only needed. Airplane Mode Needed Yes, require no operation on device during transferring. No, you can play device when transferring. From the comparison table above, we can clearly see that AnyTrans is a more appropriate choice to switch from Android to iOS, than Move to iOS. So why not give it a free try?